This is a very simple game that serves as a good introduction to game playing for children as young as 3 years of age. Children do not win or lose this game; snails do. Children often enjoy predicting which snail will get to the end first. Teachers can use ordinal numbers (first, second, third, etc.) in talking with children about the snails’ progress in the game. This game helps children learn the basics of game playing such as taking turns and following simple rules. Each snail moves only one space at a time. This can help combat the common error that young children often make in path games in which they count the space they start on as “one” and therefore always end up moving one fewer spaces than the number they rolled. To make the game slightly more challenging, children can use 2 dice. Moves would then involve either moving 2 snails 1 space each, or 1 snail 2 spaces (in the case of rolling 2 of the same color dots). This would give children experience moving more than 1 space on a move. 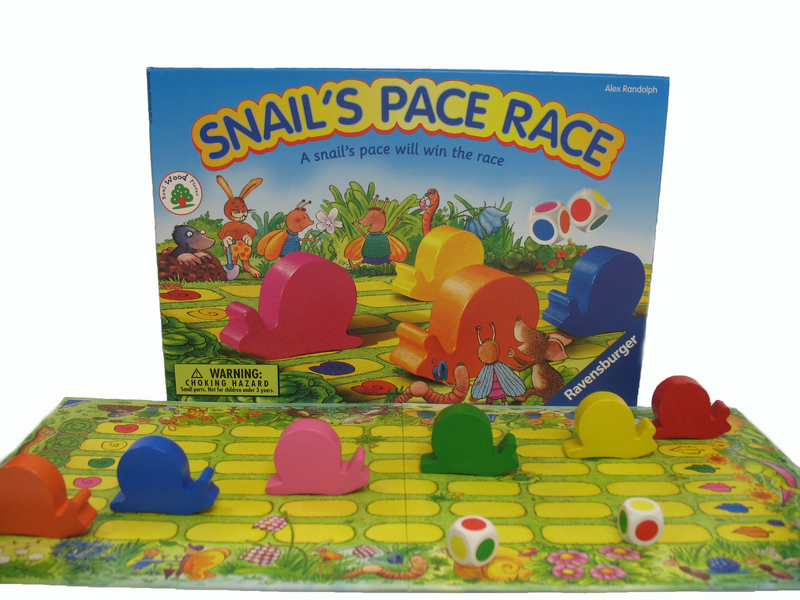 Snail’s Pace Race is made by Ravensburger.